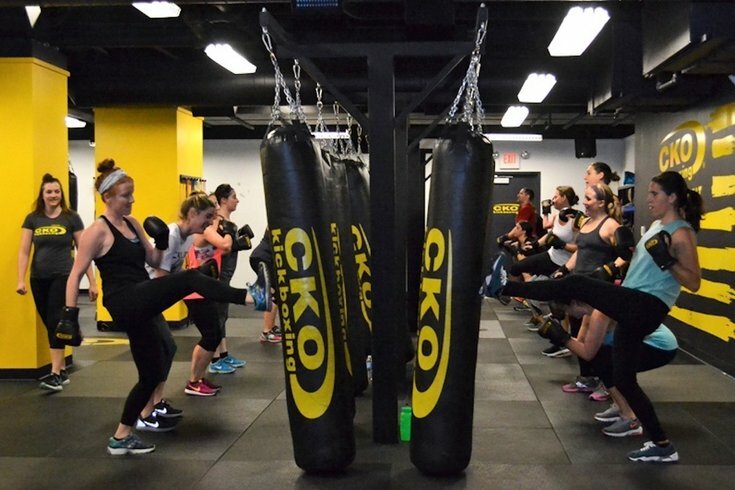 CKO Kickboxing has been the sole boxing studio in Rittenhouse for the past three years, until November when the boom began. Trend-setting and following is the millennial way. From redefining the American vision of healthy food to embracing the resurgence of retro clothes, the generation is driving cultural change. Millennials, for example, have their own preferences about working out, and they are driving a nationwide trend that has reached Philadelphia. Millennial Magazine notes that boutique fitness studios – with all the bells and whistles – now make up the majority of the fitness industry. This fast-paced and health-conscious generation wants variety from their workouts , including specialized classes like cross-training, stand-up paddle boarding and boxing. And they want to work out in an Instagram-worthy space. Boxing, which is as deeply rooted in Philadelphia history as any local sports team, was projected to be one of the biggest fitness trends for 2018 by trend-watchers such as Refinery29, Men’s Health and CNN, due in part to millennials' love of communal group fitness. Now the trend has made its way to Philadelphia, which is set to experience a boutique boxing fitness boom. The thing is, this onset of boxing fitness seems pretty fitting: our city has held stake in the sweet science for the past 100 years, with more than two dozen world champions — spanning various weight classes — calling our city home, according to the Encyclopedia of Greater Philadelphia. They include "Smokin'" Joe Frazier, "Joltin'" Jeff Chandler, Matthew Saad Muhammad and Bernard Hopkins. In fact, the greater Philadelphia area has embraced the sport since the days of bare-knuckle boxing, when men would fight to the death to become champions of their neighborhood, an illegal act at the time. In August 1876, two locals, Jimmy Weeden and Billy Walker, were the focal point of a crowd gathered in a barge docked on the Delaware River for a high-stakes bare-knuckle fight. While details of the fight are scant, Walker reportedly died from injuries sustained in the fight and Weeden found himself in jail — where he died a year later, likely from untreated injuries from the same fight. It was this deadly, illegal match that led to the legalization of boxing in Philadelphia, according to ESPN. Beyond the bare-knuckle days, September 23, 1926 is a standout date as being one of the earliest modern fights between Boxing Hall of Famers Jack Dempsey (1895-1983) and Gene Tunney (1897-1978) at Sesquicentennial Stadium in South Philadelphia. Of course, Philadelphia’s boxing history greatly developed from then on. 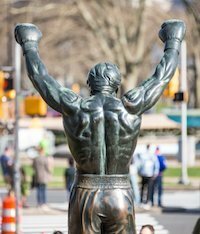 Strangely enough, the greatest hero in Philadelphia sports history is arguably a fictional boxer, Kensington’s own Rocky Balboa, played by Sylvester Stallone in the Academy Award-winning film series, Rocky. A movie filled with classic cultural references, it simply depicts a Philadelphian carrying the city’s hard-working reputation on his back as he tries to make it in the world of professional sports. In the film, Rocky punches a slab of meat. Today, fitness-loving millennials in the city are demanding a top-shelf experience that is simultaneously unique enough to accommodate the local je ne sais quoi. Enter boutique boxing gyms in Philly. Three — Rumble Boxing, EverybodyFights and TITLE Boxing Club — have either just opened or are slated to open at some point in the next several months. Interestingly, they are all opening within blocks of each other in Center City. Historically, boxing gyms — the ones where real boxers train — were tucked away in North and South Philadelphia neighborhoods. 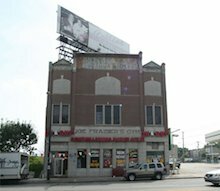 (Frazier, of course, trained for his high-profile fights in a gym on North Broad Street, where faded paint labels a building, now a furniture store, “Joe Frazier’s Gym,” at left. Two large flat-screen TVs near the lockers record scores from the accelerometer recordings on each of the heavy bags. TITLE Boxing Club, 2101 Market St. 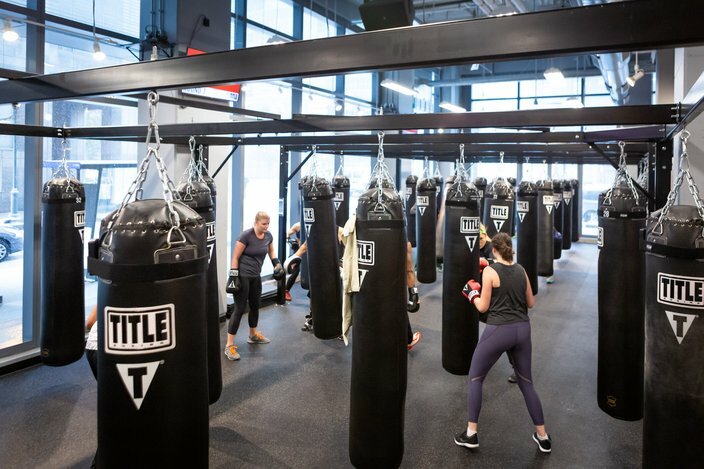 The boom began with TITLE Boxing Club, which opened its Center City franchise location at 21st and Market streets on November 1. Next time you walk by that corner, take notice through the gorgeous floor-to-ceiling windows of the very visible sweaty bodies pounding their hearts out on black heavy bags. This gym leaves the ever-popular fitness trend of a nightclub-like experience to the other guys: TITLE is all about bright, open and welcoming space. 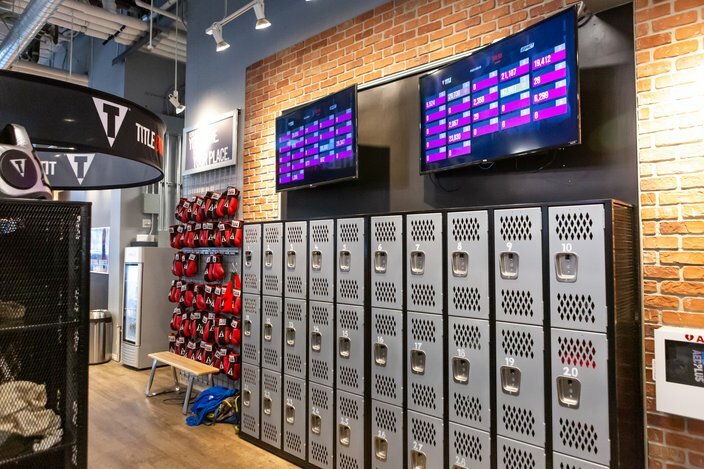 Speed and force sensors are affixed to all of TITLE’s 44 in-house heavy bags so that your stats can be displayed on a leaderboard-like screen tucked just outside of the gym’s “ring.” And that’s just one aspect of TITLE’s special sauce. It only hires legitimate boxers to instruct participants in a three-part authentic boxing workout. Plus, members get a lot of personal attention from additional instructors meandering through the ring to provide assistance or offer an extra challenge. Right now, TITLE is only offering a 60-minute boxing class. Memberships start at $89, but all are welcome to drop in for $30. 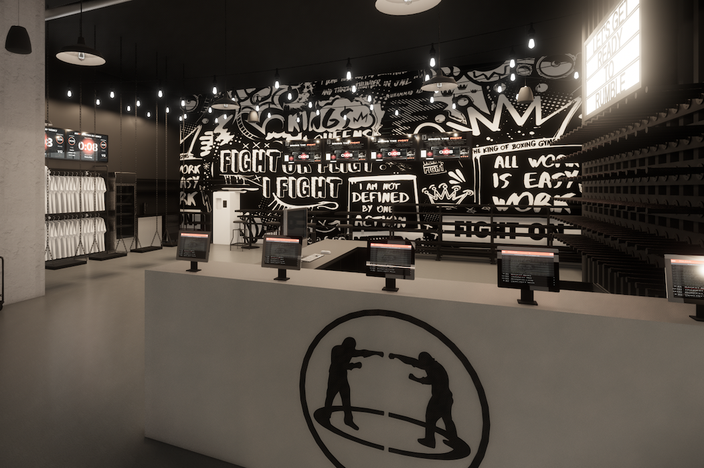 EverybodyFights, a Boston-based boxing gym founded by the son of a boxing champion, George Foreman III — a boxing champion himself — will be the next to welcome members. Slated to open in January 2019 at 1900 Market St., the gyms plans to fill its sizable 12,000-square-foot space with a full-size boxing ring and four classrooms, including dedicated hanging bag, circuit and treadmill studios. Additionally, the gym will feature a 3,000-square-foot open gym stocked with cardio equipment and free weights because the gritty boxing atmosphere comes with all the bells and whistles of a luxury fitness club. Speaking of amenities, EverybodyFights will feature a full-service locker room with steam room, towel service, blow-dry bars, pro shop, juice and coffee bar, and a lounge area. Look for a fast-paced group bags class, a treadmill workout infused with mitt work and private boxing lessons. EverybodyFights has yet to announce an official opening date (though it could come soon), class schedule or membership pricing. The last to open perhaps, but most certainly not least, will be Rumble Boxing. This New York City-based chain known for catering to the needs of the Big Apple's fitness-loving celebrities and models — one scroll through their Instagram and you'll be amazed by all the beautiful people — is set to open at 1520 Walnut St. in the spring. The Rumble workout incorporates high intensity interval training (HIIT), strength training, and metabolic conditioning for an intense, fast-paced workout in 10 rounds and 45 minutes. When Rumble first announced its Philly plans, the gym was slated to open in fall 2018, but spring is the new target date. 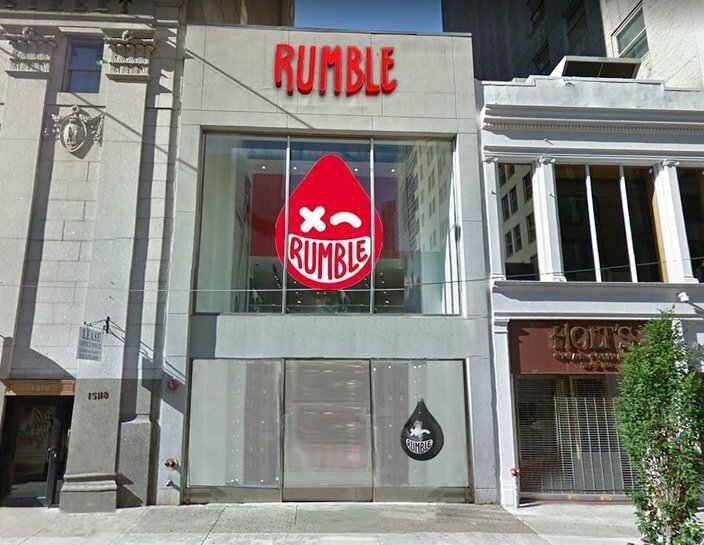 Rumble will be taking over all three floors at the address to accommodate an 8,000-square-foot gym, including men's and women's locker rooms and DryBar products. According to Rumble representatives, they are ready to make Philly their home. "We will definitely be paying homage to the Italian stallion aka Rocky here." The TITLE Boxing Club of Philadelphia at 21st and Market Streets. Just because more boxing fitness is taking off in Philadelphia right now doesn’t mean the concept is new to the region. Since December 2015, Center City has been home to CKO Kickboxing at 1616 Walnut St., which boasts calorie-torching HIIT kickboxing classes. And gyms like the Sporting Club at the Bellevue long have had boxing on their schedules. In the suburbs, Fuel Cycle Fitness has been offering boxing and spin fusion classes since its Ardmore opening in December 2015. StRIDE Spin and Fitness, a newcomer to the scene after opening a Phoenixville studio in August, hosts rhythm-based boxing cardio classes. "For the past three years we have been the only cardio kickboxing gym in Rittenhouse, which is a very yoga- and spin-centric town. We are blessed to share our passion with this city and just knew when opening people were going to love it!," she said. "There's really nothing like this type of workout — in one hour you can burn up to 1,200 calories, relieve stress, build strength and tone lean muscle. "We really feel that the influx of boxing gyms will bring even more visibility to what we do," she continued. "Each one of these new concepts is unique and has its own nuances, so people can find what's right for them." The best part of this new wave of boxing in Philadelphia is that it’s a great workout. Livestrong cites boxing to be one of the most physically demanding sports on your lungs, heart and muscles, packing benefits like a longer life expectancy, less stress and more muscle in every punch. Shape Magazine reports that boxing is also a two-for-one cardio and strength workout, which helps improves overall fitness, according to Jessica Matthews, an exercise physiologist for the American Council on Exercise. "In addition to boosting your strength and cardio, boxing improves a number of skill-related parameters of fitness, including balance, coordination, reactivity, and agility," she says. With that in mind, Harvard Health suggests that boxing is a great form of exercise for older adults and young people alike. And if you're hesitant to jump on the boxing trend here in Philly, there's a very good chance you can score your first boxing class free – TITLE and Rumble both this — so you can see if you like the workout before you have to pay for it.